Not very good at relaxation, Mel Wilkins, left, turned his attention to gardening after a heart attack. 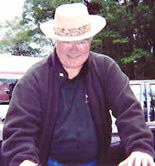 First he designed the Sensory Garden at Arc of Anne Arundel County. He helped landscape the grounds at the nascent site of Chesapeake Childrens Museum, center. And now he is spearheading an effort to clean and revitalize the headwaters of Spa Creek, right. Ask him about the title and hell laugh his easy laugh. Well, Im the worlds largest angel, says he. His heart is full-sized, though it needs a pacemaker to keep going steady. Call me lithium man, he laughs. Perhaps the only thing exceeding the size of Mel Wilkins heart is the size of his vision. As such things do, it started small. Im not very good at relaxation, he says, and his heart condition had forced him from the defense industry into early retirement. He languished a year, until his daughter, Laurie Scible, found a garden that needed a gardener. Arc of Anne Arundel County also needed funding for its dream garden, and MarylandScape grants  which might bring them that money  were due in a few days. I started learning about native plants real fast. I wrote a proposal and we won, said Wilkins. The result is Arcs Sensory Garden, one of only a few in the world. Last August, Wilkins stretched his vision across Spa Creek to the new Chesapeake Childrens Museum. The Museum has been seeking grants and volunteers, trying to get up and running in the old WYRE radio building. A lot of work needed to be done to improve the look of the building, both inside and out, and quickly, to prevent vandals from taking over. Lured to their board, Wilkins quickly put in a BayScape garden, which incorporates native, Bay-friendly, drought-resistant plants, which require no chemical fertilizers, pesticides or herbicides. A grant from Chesapeake Bay Trust paid for that front-door garden. 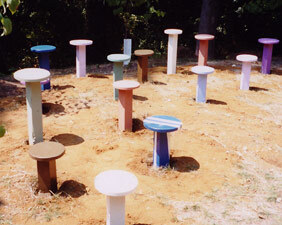 Next came an herb garden and mint garden, native fruit trees and  with the crew of the submarine USS Maryland  painted wooden toadstools for an outdoor classroom. He has a passion for native landscaping, says Woods, which suits the Museums emphasis on the local environment, the Chesapeake Bay watershed, local history and Native American plants, foods and medicines. Wilkins work on the Museum grounds set his sights higher, to revitalizing the Spa Creek headwaters. Weve got a unique situation here, says Wilkins, with the confluence of Bay and fresh waters. A survey discovered the presence of a river otter, a rare find. Now, Wilkins is conning anybody he can into helping out on the Spa Creek Headwaters Area Restoration Project. Some of the angels in his band include LeeAnn Bogan, director of Annapolis Recreation and Parks; Kevin Kelly of Environmental Systems and Analysis; Mike Drum of Drum, Snell and Associates; and Kerri Bentkowski, grant manager for Chesapeake Bay Trust. All helped with site design ideas. The plan is to clean up the headwaters of Spa Creek, control erosion on the banks and plant native grasses in and around the creek. The first step was to kill off the phragmites, a tough invasive grass thats choking the creek. 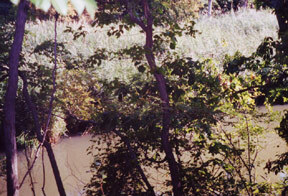 The Maryland Department of Natural Resources did an initial spraying, leaving a creek full of brown phragmites. This Saturday, national Make a Difference Day, midshipmen and all sorts of people willing to get dirty will pitch in to plant and lay trails outside the Museum as well as build, paint and finish inside. They will also remove the phragmites debris as well as garbage from the municipal storage yard upstream in the creeks watershed. After that will come planting of thousands of bay grasses and aquatic plants, as well as berry bushes, native azaleas, dogwoods and sweet bay magnolias to control erosion and attract wildlife. Rob Schnabel, of Chesapeake Bay Foundation, helped with the plan to control erosion. Eventually, Wilkins envisions rain gardens and native bogs with the double duty of teaching kids and controlling run-off from the Bates ballfields. He talks about interpretive trails in both English and Spanish, serving the large Hispanic population in the neighborhood, and of teaching kids the names of native trees and about the watershed. He hopes to get kids involved with Bay science, doing water sampling and conducting plant and animal surveys. And he envisions a handicap accessible trail through the woods. Ill do a little today, a little tomorrow, he says. Such visions need helping hands. This Saturday and in the months ahead, the gardening angel needs friends and neighborhoods to support the Museums projects and after-school programs by mentoring and by adopting parts of the watershed. Travel is no excuse to give up your vote in the November 5 election. If you are registered but know that you cant make it to the polls, act now to make your vote count. You have until October 29 to apply for an absentee ballot from the Anne Arundel County or Calvert County Board of Elections. Calvert, meanwhile, has mailed out 642 absentee ballots. Im one of those who wants my vote to count but who will be in distant places come November. It took one phone call, which was answered by a live person, to start the process. Getting the number for the Board of Elections was the only hard part. Its not under county government in my phone book, but I found it on the voter notification card that I received in the mail at the end of July. The Anne Arundel number is 410/222-6600. In Calvert, call 301/855-1376. Calling, I explained that I would be away from the county during the election. I gave my name and address and promptly received the promised purple card in the mail. I filled in the simple application and mailed it right back. In a few days, I got a notice agreeing that I was eligible to vote with an absentee ballot and assuring me that it would arrive in the mail in mid-October. The official ballot arrived in a timely manner with clear instructions on how to mark the votes with a No. 2 pencil, which was included in the package. Just like at the polls, the voter draws a line to connect two ends of an arrow to choose governor, delegates and all the others. Theres a receipt stub to tear off. Then the ballot is sealed in the enclosed Ballot Envelope. Voters must sign the Oath of Absentee Voter on the front of the envelope, swearing that they are eligible to vote and cannot make it to the polls in person on election day. Signing the oath is as important as marking your vote. In its sealed ballot envelope, the ballot goes into a pre-addressed mailing envelope. Add two first-class stamps and make sure it gets to the post office before Election Day. If you are running late or have a last-minute change of plans, theres still a way out. 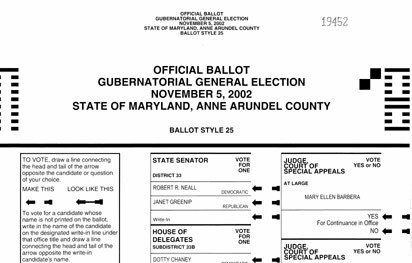 After October 29  but before Election Day  Anne Arundel voters can fill out applications in person at the Glen Burnie office. Calvert voters go to the County Services Plaza in Prince Frederick. The table on the dais at South River High School in Edgewater was as long as a bus this week, and that was a good thing. For at one time, it held 13 General Assembly candidates appealing to a sizable audience on matters related to land and water. On a chilly autumn night when the World Series played on television, a crowd approaching 500 people showed up for the public policy equivalent of a Who We Elect Matters forum. It was sponsored by a broad alliance of environmental advocacy groups. Single-issue ruckuses over development schemes have turned out bigger green gatherings in Anne Arundel. But both organizers and candidates were gleeful at such a big gathering during a season when the sniper, war-talk and a cacophony of troubling news has distracted many would-be voters. For the candidates that made a commitment to come, I think it demonstrates how important these issues can be, said Amanda Spake, president of South Arundel Citizens for Responsible Development, the group that spearheaded the event. Other sponsors of the event in what could be a potent new alliance include: Maryland League of Conservation Voters; Alliance for Rural Business; Chesapeake Environmental Protection Association; Shady Side Peninsula Association; Sierra Club of Anne Arundel County; and South River Federation. The event drew 17 candidates for the General Assembly, county executive and county council. The notable absence was County Executive Janet Owens, who accepted another invitation to debate challenger Phil Bissett in an Anne Arundel Community College town meeting that drew 100 listeners the same evening. David Sheehan, her campaign spokesman and spouse, said that Owens had told organizers that the evening was not a good one for her and that her need to stay tuned to the sniper rampage added a further complication. The event was moderated by Terence Smith, of Shady Side, who is senior producer for The NewsHour with Jim Lehrer on PBS, and broadcast live on WRWR, 97.5. If you were to take a walk through the woods in early fall, you might be charmed by the discovery of yellow flowers blooming on a small tree so late in the year. If the odd encounter with a flower piqued your curiosity, you could discover a number of curious facts and interesting folklore. Lets say that, as part of your research, you took home a sprig. You might be setting yourself up for an encounter that could  depending on your temperament, beliefs and other influences  cause you to think that you had taken a cutting from a haunted species of silvaculture. If you placed the inert twig, with its dormant seed capsules, in a warm spot such as a sunny window and then went about your business, you could be alarmed by seeds shooting from the capsules with enough velocity to travel over 20 feet. Then your state of mind might change from curiosity to vexation. What is the name of the fascinating plant whose spirited cutting shot its seed across the room? Your field guide reports that your sample is aptly named witch hazel. It would be natural to assume that the occult nature of the name is due to the trees startling seed-spitting ability, its oddly timed blooming period or even for the strange witches hats that form on the leaves  about which well have more to say later. Yes, why not designate such a spirited plant with a bewitching name? Actually, the tree was named for its resemblance to the European hazel tree, which, according to legend, could be used as a divining rod to find witches and water, even gold. 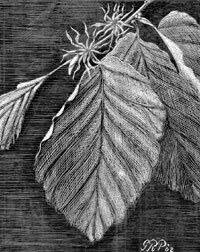 The unusual aspects of the American witch hazel may have reinforced the newly arrived Europeans superstitious belief in the woods powers. The two species are not related, despite their resemblance. Some trees have winged seeds; others rely on squirrels to disperse their seeds. The witch hazel uses physics. Just as the witch hazel is displaying its autumnal blossoms, the fruits from last years flowers are reaching maturity. The fruits are shiny brown seeds encased in hard capsules. The capsules shrink as they ripen, squeezing the seeds tight against the base of the capsule. When the capsule splits in two, the seed is forcibly ejected. Witch hazel has medicinal qualities as well. The aromatic leaves of the shrub were used by Native Americans to treat skin ailments and to staunch bleeding. European colonists also used it for similar purposes. Even today, bottles of Witch Hazel are sold in drug stores as an astringent to cool and cleanse the skin. About the witches hats: They are cone-shaped bumps, or galls, that form on the leaves when insect parasites lay their eggs in leaf tissue. The larval insects produce chemicals to which the leaves react by developing tumor-like growths. These galls provide a place for the insects to grow as well as food to eat. Other species, notably oak and goldenrod, also produce galls  but only on witch hazel do they resemble witches hats. Our Creature Feature comes from Alaska, which is abuzz with sightings of a huge bird that locals are likening to a small airplane in size. The Anchorage Daily News on Monday quoted people from two villages, including a pilot, as saying the bird looked like something out of Jurassic Park and had a wingspan that looked to be at least 14 feet. Hes huge  really, really big. You wouldnt want to have your children out, the pilot said. Fish and Wildlife officials are mystified, too, but say that it could be a very large eagle.